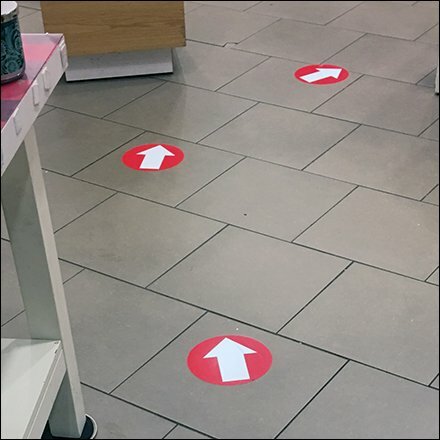 Located rear-of-store, this retailer’s service counter offers this Floor Graphic Breadcrumb Trail to Store Checkout to help you find the cashwrap and assistance. But coincidentally the breadcrumb trail just happens to lead you past almost all of the store’s merchandise and offerings. For whatever reason the approach worked because customers filled 3 lines awaiting check out. Follow the trail in the Floor Graphic Breadcrumb Trail to Store Checkout gallery of images and be glad you weren’t one of the customers awaiting service.